The Vegan Tart delightfully challenged my preconceptions – I didn’t imagine that vegan cakes and savouries would tempt me, or that their ‘Head Tart’, Dumisani Nyathi, would turn up sporting a beard, but after talking to him I’ll be pigging out on a ‘lime & thyme’ cake at the next opportunity! 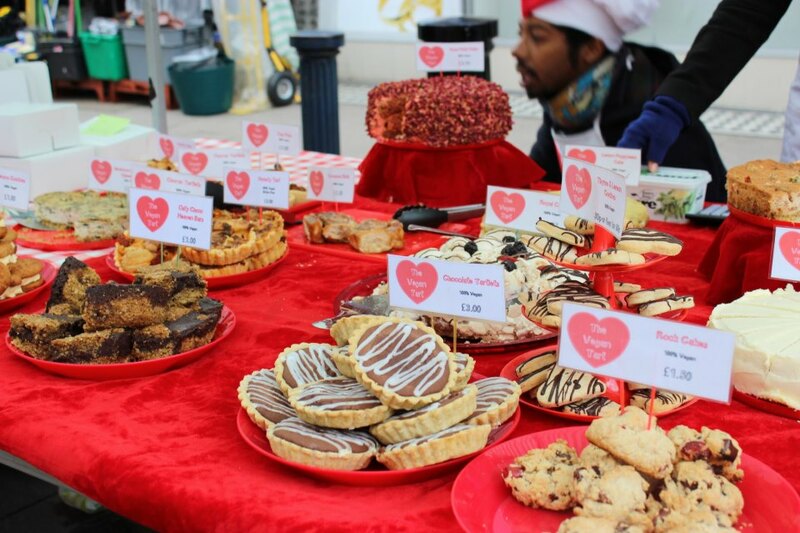 Read on to find out what made The Vegan Tart special enough to win ‘Best in Show’ at the 2013 Brixton Bake-off. Tell us a bit about The Vegan Tart, what you make and where you sell it. I run The Vegan Tart with my partner. We make high quality vegan cakes and savouries. We bake traditional cakes but use our unique combinations of flavours to make them special. Since 2011 we’ve been selling at the ‘Bakers and Flea’ market in Brixton on Station Road on the first Saturday of every month (next one April 5th). As well as the regular Brixton crowd, the Brixton Vegan Walkabout meetup comes along, bringing us up to 35 eager customers! Our products are also available at The Lazy Rhubarb in Tulse Hill, and we do other ad-hoc markets and events, such as the Greenwich Food Fest in February and a recent vegan high tea at the Effra Social – these are listed on our website www.thevegantart.co.uk . We also take orders and are often baking away for a birthday or wedding, making sure there is great tasting food which can be eaten by everyone. I’ve been vegan for about 5 years. Even before I became vegan, as an American, I found British cakes very dry, and after it was worse – the restaurants seemed to provide only dry bland offerings for vegans. I felt I could make better ones myself, and started experimenting. Then friends started to buy them, and orders started to take off in 2011. I was a support worker at the time, but after I went travelling to Spain and north Africa I began to think about working for myself, and decided to make baking a business on my return. It doesn’t yet bring in enough to pay the rent, so I work 3 days a week as a gardener, but we are currently negotiating with the ‘cat cafe’ opening in the East End, and once we have two clients of that sort, I can bake full-time! Besides them all being completely vegan, we do both cakes and savouries, and try to make our products a bit different from the usual – we mix it up a bit, jazzing up the flavours to give people alternative flavours eg a lime & thyme cake, a savoury fig & asparagus tart. We were also officially acknowledged as special by winning the Best in Show and Best Savoury categories at the 2013 Brixton Bake-off! There were over 30 entrants and the judges included the Mayor of Lambeth, Ms Cupcake, the manager of Morleys and Levi Roots. It’s not just the quality of our products which makes us stand out though – we have quirkiness to our brand, such as our special apron and hat outfits, our branded granny trolley and army bag for transporting our goods, my job title (Head Tart), etc, which make us stand out from the crowd – people often make comments or ask to take pictures. I’d like to have a branded cargo bike to transport my goods in. It’s all very fun and home made, for example a friend made the aprons and hats, and we used an old banner to brand our trolley. Sounds exciting – how do you go about marrying unusual flavours? Even as a child I used to try making weird concoctions of noodle packs, those were my first experiments in flavour! I suppose it meant I was used to trying things out… I also invested in the Flavour Thesaurus. It’s not that good for vegan produce, but can give good ideas, it makes us think about the way the food hits the taste buds. We also research into websites and recipes and when we see an interesting combination of flavours, try it out. That’s how I discovered the ‘fig and asparagus’ combination. You have a section on your website for ‘themed and quirky’ cakes. What’s the strangest cake you’ve been asked to make? It was a topsy turvy cake for the annual ‘time for tea’ event at the Mental Health Foundation. I made a ‘Mad Hatters’ cake involving big chunks of cake which had to be balanced at crazy angles – that was not an easy cake to make! What attracted you to get involved with Makerhood? I wanted to get involved from the beginning but at that time it was just in Brixton and we were in Tulse Hill, I could see all these great networking events and very personable emails coming out and I kept thinking ‘hurry up, hurry up and come to our area!’ so I joined as soon as it opened to Tulse Hill, about a year ago. It’s great, very friendly and affordable and the events are very useful. I’ve been to events on ‘branding your stall’, social media, and a food taster where Jay Rayner of the Observer gave feedback and a local shop owner helped with pricing, it’s really nice to have that kind of help and diversity. I’m now a member of the steering group for Makerhood Lambeth, which gives me an opportunity to interact with a wide group of individuals who have a passion for creating and sharing that passion with others. What do you like about living &/or working in Lambeth? I’ve lived here since 2003, and I don’t know what it is about Lambeth, it’s brilliant, so diverse – in a lot of people’s minds it’s just Waterloo or Brixton, but there are all these places you can go to and the communities are never the same, the shops are never the same – I’m glad that Lambeth hasn’t been “uber-branded”! What’s your hot tip for a hidden pleasure or treasure in Lambeth? Bonnington Cafe in Vauxhall. It’s one of Lambeth’s hidden gems. Also the Rookery in Streatham, which is never busy and is very secluded…and the things you see by looking up. Opposite the White Lion in Streatham is a building with 4 elephants, take a look next time you are up that way! Brixton-based textile designer Robyn tells us how her great-grandmother’s notebook inspired her brand, and of the links between creativity and mental health. Tell us a bit about Archie Mac London, what do you make or do? Textile design. It’s all about stories! I use these story-telling textiles to make cushions and purses, and I’m currently working on a range of washbags, make-up bags and iPad covers. In future I plan to create fashion-wear too. What do you mean by ‘story-telling textile design’? It started from a project about childhood. I had the intention of bringing the fun elements of childhood into a more adult form of design. I interviewed a friend who gave me a fantastic collection of childhood pictures from the ’80s. They were wearing garish T-shirts with Simpsons cartoons on, and I was fascinated by the hair shapes of the characters. I began to manipulate them and use them to create patterns. In this way the designs originated in elements of a childhood story, and carried them into the future. Icons of my own childhood, such as a headless doll, now feature in my designs. What kind of processes are involved in creating your cushions? I begin with childhood images and objects and create collage – using both old-style paper and scissors and computer programs – to explore these shapes and take them backwards and forwards. Sometimes surprising patterns result: some have come up with an Islamic look and then on the next iteration been reminiscent of African prints, others have the look of fractals. The final designs are printed onto fabric, which I sew into cushions, bags and other items. Commercial printing is extremely expensive, so I’m currently learning screen-printing so that I can also do that part of the process myself in future. What inspired you to get started with Archie Mac? The precious discovery, about a year ago, of an album my great-grandmother, Annie, had kept of her own notes and the charming sketches and cartoons of my great-grandfather, Archie McMillan. He signed each one with his monogram – AMcM, combined to make a little spider – and this inspired the name (Archie Mac) and logo of my brand. It was so exciting to find this creative ancestry in my family. There has been something of a gap in creative expression in the intervening generations! I didn’t come from an art background. Until recently I worked in social care, as a mental health support worker with the Community Options Team, and I repeatedly observed the importance of creative activity in restoring confidence and self esteem. This sparked the idea of setting up a social enterprise aimed at developing creative opportunities for other women (which I’ve recently started with workshops at the Eaves Centre in Brixton). Newham College recognised my enthusiasm and took a chance on me, offering me a place on their Fashion Foundation course, which gave me the opportunity to start experimenting with textiles. The storytelling aspect. I’d love to create bespoke designs for clients which reflect what’s important to them – perhaps featuring images or icons from their own childhood, or those of their children – and incorporate these into textiles or products which are unique to them. A wedding dress, perhaps! I work primarily with fabric but there is no reason why the designs shouldn’t be used to decorate other products. Your own story-telling kettle, or toaster? I currently hand-stitch my logo, derived from Archie’s monogram, onto every piece. I love that personal connection with each item of my work. Tell us about the exciting new workshops you are involved with? These are workshops in embroidery and beading at the Eaves Centre, a Brixton-based centre for supporting women who experience violence. Currently they are monthly, but I am keen to make them more frequent. The workshops teach new skills and an outlet for creative expression that bypasses any fear about drawing. The women who attend are each making small panels. We’ve also been making up embroidery packs to send out to women who cannot or do not choose to come to the centre, to encourage them to participate. We are using the theme of ‘hope’ and will combine the small pieces we make into one large panel. We intend to display the final panel to raise awareness and possibly funds for the Eaves centre. We’ve received a lot of support from local sources, including Simply Fabrics, Freecycle, and Fiona of Oh Sew Brixton!, for which we’re extremely grateful, as we had no funding for the project. The network is such a wonderful precious thing: there is this lovely cycle of kindness there. It can be lonely being creative and it’s great to know that there’s somewhere so welcoming and supportive in the borough. I don’t know what it is about the borough, but it attracts so many creative people. There is a really good network of creatives here, and I have received so much support from people such as Sinead of Crafty Fox, and Colin Crooks and Lydia Gardner on the ‘start your own enterprise course’ run by Tree Shepherd, and also getting involved with Brand Amplifier has been amazing and brilliant! Also, I greatly value that working in mental health gives me the opportunity to meet people with such different lifestyles and life experiences from my own. Being exposed to such a multicultural, multi-layered community is exciting and inspiring . For example, in the Eaves Centre workshops people bring so many different experiences and ideas to the table. One best memory I will take with me if and when I leave will be the conker trees by the Lido – I think I will always feel that childhood excitement from picking up shiny conkers! We’re planning a makers’ event in West Norwood on the evening of 26 July, before everyone disappears for the summer. John Price has very kindly offered the Portico Gallery, along with drinks and nibbles. a speaker from West Norwood Feast. We also thought it would be fun to have an interactive space where everyone can contribute to a drawing/collage/painting on a particular theme, eg London 2012.
helping organise the interactive activity. If you have any other ideas or comments, do get in touch by emailing kim@makerhood.com. I will be out of London next week but will try to respond to emails as promptly as possible. If there’s enough interest in the event going ahead, we’ll hold a planning meeting the week after, probably 18 July, to confirm plans and details. We came across this today (thanks Rachel! ), and thought many of you would be interested in it; news of London’s first Renegade Craft Fair. Typically based in the States, Renegade organise annual free-to-attend events focussing on “DIY and indie-craft culture”. This Autumn, London joins the ranks of Brooklyn, Chicago, San Francisco, Los Angeles and Austin on their list of venues. Based at The Old Truman Brewery on October 8+9, 2011, from 11am – 6pm each day the event promises workshops and plenty of opportunities to buy and sell! Applications for independent craft artists to take part are open from today until July 29th. Makers can submit an application to sell here. Whilst you can find out more about the history of The Renegade Craft Fair here.